Estate grown, “bordeaux style” blend of Cabernet Sauvignon, Petit Verdot and Cabernet Franc grapes delivers a rich and enchanting experience loaded with dark fruit flavors of black current, blackberry, cassis, anise, cocoa and hints of eucalyptus. It has subtle oak and balanced tannins along with licorice, violets, tobacco and moist earth undertones. Will be at its height around the year 2011, if you have not already opened this delicious wine. 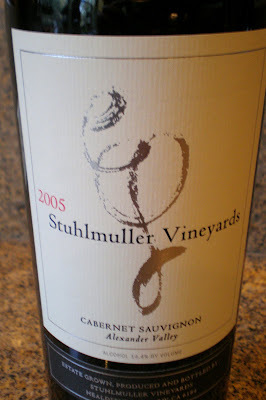 Stuhlmuller Vineyards is located at the southern edge of the Alexander Valley, where it converges with two other highly regarded Sonoma County appellations, Chalk Hill and the Russian River Valley. On its eastern edge, the 150-acre vineyard borders the Russian River. Situated in a unique location that is part river benchlands and part hillside, the vineyard benefits from its alluvial gravel soils and the more rocky soils that comprise the hillside sections of the vineyard.